Happy Wednesday everyone, I am feeling a bit better and so I am finally going to write my first post of 2017! I decided to start the year off with a sparkly look to defy the notion that we are bound to wear certain things for certain occasions or only during certain times of the year. I believe that we can wear whatever we want whenever we want as long as we feel good. And quite frankly if that means wearing sequins to the dentist then I say go for it! I also think it is a great opportunity to show you how to get a beautiful look on sale after the holidays for a fraction of the cost. Maybe you have a winter wedding coming up or some other function that you might need something dressy for. I also chose separates so that these pieces could give you extra mileage when paired with other items in your wardrobe. I have been in love with the pieces that Ashley Nell Tipton has designed for JC Penney for their Boutique+ line since her first collection was released back in September. So when her holiday line came out and I saw this skirt in this magnificent shade of lilac I was stalking the website until I could put it in my shopping cart. My favourite colour is purple but lilac has a little bit of a more special meaning to me because of my great grandmother. I was fortunate enough to have my Great Grandma Gale who was staunchly British with me until I was 10 years old. Not only did she teach me how to drink proper British tea and how to act proper, she also shared her love of the colour purple with me and in particular lilac. I had numerous outfits when I was little that she chose for me in this colour and I cherished everyone. The other great thing about this skirt being lilac is that it can be worn for spring and summer too. It is made of a lightweight polyester that looks like satin so it would also be perfect for a summer wedding, graduation etc. You could also totally dress it down by wearing it with a simple t-shirt or tank top. And I think a floral print would look beautiful with it. I am wearing the size 30 in this skirt. I ordered the 28 and 30 because I wasn’t sure and I wanted the box pleats to lay flat so extra volume would help with that. The 28 easily fit me in the waist but the pleats just didn’t quite lay right. The only complaint that I do have with the Boutique+ line is that I find the bottoms can run a little on the small size, I think particularly because I am pear shaped. I have to be honest and say that none of the coordinating pieces from Ashley’s collection really spoke to me for this skirt so I went on the hunt for an alternative. And I was pleasantly surprised when I walked into Penningtons one day and found this sequin tank. It was perfect for the skirt because the sequins have shades of purple and you can change the pattern of them by giving them a brush with your hand. I really liked the design of this tank because it had a plain knit back so that the sequins don’t drive you crazy and thick wide straps so you could wear a normal bra. I am wearing the size 4x. I could have sized down since I tucked it in to the skirt but if I want to wear it with something else, I liked the loser fit. I would totally rock this for girls night out with a pair of jeans. I normally wouldn’t add something over top but let’s face it, its’ winter and it has been darn cold in my neck of the woods! So I grabbed this oldie but goodie velvet jacket that I had in my closet. Although trends come and go I just couldn’t let go of this jacket that I have had forever and I am so glad I didn’t because here it is back on trend again. I have given you a link to a current alternative. I liked how the jacket pulled the look together and provided a sense of polish. I personally don’t go to Church but I think with the jacket and some understated accessories this would be perfect for it. And velvet isn’t going anywhere for winter so this is perfect for the office with a pair of dress pants and a blouse. Finally I decided to recycle some of my favourite accessories from my collection to pull this look together. Don’t worry, I have provided you with links to some current alternatives, I would never leave you hanging without options! After all, a girl needs options! 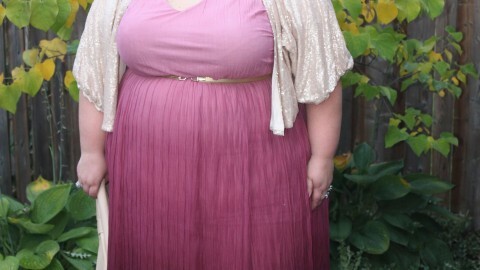 Keeping with the sparkly theme I added flats from Lane Bryant because I am just more comfortable in flats period. If you like to rock a heel than I say go with what works for you. Then there was this bag and bangle that both like bows from Torrid. I felt they were statements that made a pop. Finally there was my very special necklace from my bae. It is from an exclusive Atelier collection designed by Jean Paul Gaultier for Swarovski. Doesn’t he have great taste? Right now you can get this skirt, tank and a similar jacket for only $51 US. I think that is a pretty great deal for some very versatile pieces. Special thanks to Robert of Robert Skuja Photography for these beautiful pictures taken on what had to be the coldest day! Absolutely LOVE this outfit. You look awesome and the colours are just perfect! This outfit is made for you! Absolutely love purple tones myself! This is very lovel!